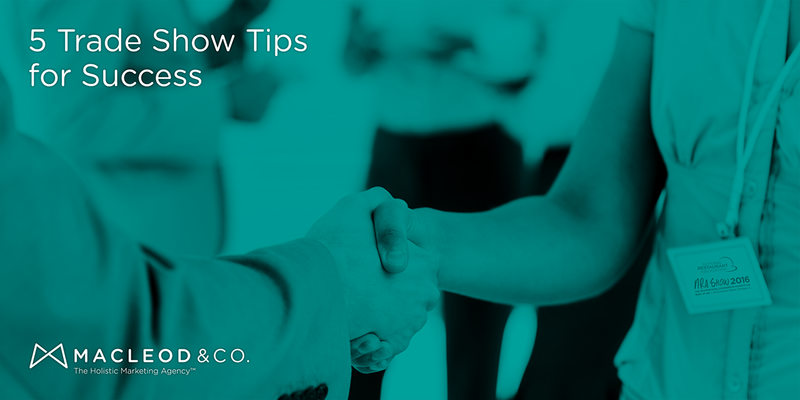 5 Trade Show Tips for Success | Macleod & Co.
Trade shows can provide fascinating insight into an industry. Case in point: this year I attended the National Restaurant Association Show for the first time, and in four days my understanding of (and appreciation for) the food service industry grew exponentially. I rubbed shoulders with chefs, restaurateurs, and inventors, learned how a combi oven works, and tried an edible cup. As an attendee, it goes without saying that my experience was vastly different from that of an exhibitor. However, I certainly observed some interesting variations related to the manner in which exhibitors interacted with visitors. Some exhibitors actively engaged passersby, while others kept to their booths, heads down, faces glued to their smartphones, or (worse yet!) backs turned to the crowd. On the heels of this experience, I’ve been reflecting on something: for many people, trade shows are intimidating. Depending on the person, the prospect of spending 2-4 days at a booth vying for the attention of strangers will be perceived as either exhausting or exhilarating. Personality type (introversion vs. extroversion) very likely has something to do with this, but even the quietest and most reserved person can find ways to maximize his/her impact without even leaving the booth. Research has shown that introversion/extroversion can be fluid (hello, ambiverts!). However, our society tends to revere qualities which have been traditionally associated with extroversion, such as being outgoing and having a wide social circle. For this reason, many individuals who identify primarily as introverts (especially entrepreneurs) will find it beneficial to “practice” extroversion. A textbook introvert myself, I have developed certain tactics that help me approach situations where I expect social engagement to tax my reserves. If the prospect of exhibiting at a trade show is less than thrilling, approach it one step at a time. 1. Decide on a conversation-starter (or two) in advance. Consider how you might approach someone and what you can say that will feel natural. Practice saying it to yourself — having said it out loud will give you a little extra confidence when the time comes to put it into practice. 2. Focus on one person or conversation at a time. This can be difficult in a trade show setting (60,000 people milling around is distracting! ), but if you can manage to harness your attention and focus on one of them, the quality of your interactions will improve. This is related to the point above: when you really focus, you listen well. People will talk most readily when asked thoughtful questions — you can come up with thoughtful questions by listening. If you are able to establish a rapport with someone through conversation, you’ll find it that much easier to deliver your pitch. Have realistic expectations of yourself and don’t let yourself burn out. People draw energy in different ways: some might actually be more energized after a day spent in a crowd, while others need time alone to recharge. If you fall into the latter category, use whatever free time you have — whether it’s an hour or an afternoon — to reenergize. 5. Don’t sit and look at your phone. I’m not talking about glancing at your phone to check the time, I’m talking about being so absorbed in your phone that you are tuned out to what is going on around you. If you’re at a trade show and you’re doing this, I’m bummed for you. Of course, all of this assumes that the trade show you’re attending is a valuable opportunity for your company. If you’re not sure whether it’s valuable, you should probably take a few steps back — the value discussion needs to come first and will require some research. If you are in a situation where you need to attract attention, but doing so doesn’t come easily, try using your natural personality traits to your advantage — draw people in by starting conversations and asking good questions, and give yourself ample opportunity to recharge. Lastly, I would be remiss if I did not recommend the book The Introvert Entrepreneur by Beth L. Buelow. Though it may seem counterintuitive, several typical elements of introverts’ personalities actually work in their favor, especially when it comes to entrepreneurship. About the Author: Abby Carlson is an Account Executive at Macleod & Co. based in Minneapolis, MN. As the Holistic Marketing Agency ™, we believe that in a hyper-social world, culture drives success, every employee is a customer touchpoint, and every customer is a broadcast network. We live at the intersection of marketing and organizational effectiveness. And we see marketing as the entire process of bringing a product, service or business from inception to maximum ongoing profitability.